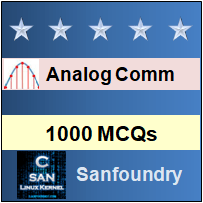 This set of Analog Communications Multiple Choice Questions & Answers (MCQs) focuses on “Single Tone Modulation”. Explanation: Emitter Modulator operates in class A region. It has a very low efficiency. The output power is low so for modulation at high level, it is not suitable. 2. Why AM is used for broadcasting? Explanation: AM detectors are generally, square law demodulators or envelope detectors at the receiver. As AM detectors at the receiver end are simple circuits and avoid any kind of complex structure, therefore, AM used for broadcasting. Explanation: Single tone modulation consists of only one frequency component in the baseband or message signal. Thus, modulation of carrier wave is done by a single frequency component only. Explanation: Spectrum of Am wave consists of a carrier with upper sideband and lower sideband. If carrier frequency is Wc, then the two sidebands produced by it are (Wc+Wm) and (Wc-Wm), where Wm is the frequency of the message signal. The amplitude of the carrier is A and that of the two sidebands are mA/2, where m is the modulation index. 5. The minimum channel Bandwidth is used by which modulation technique? Explanation: A signal has two sidebands which are exactly the mirror images of each other. So we can remove one side band which further reduces its bandwidth. In SSB-SC modulation technique, the carrier is suppressed and only either of the sidebands is transmitted. Thus, SSB-SC has minimum channel Bandwidth. 6. Neper is ________ decibel. Explanation: Neper is a logarithmic unit used for finding ratios of power quantities. Like decibel it is also a dimensionless unit. 1Np = 20/ln⁡10 = 8.686 db. Explanation: Maximum frequency = 810 + 6 = 816KHz and Minimum frequency = 810 – 6 = 804KHz. Moreover it has a bandwidth of (816 – 804) = 12KHz. fc= Carrier frequency, fm= message signal frequency). 8. Find lower frequency component in AM wave, given that highest frequency component is 900KHz and bandwidth is 12KHz? Explanation: Highest frequency component is 900KHz and bandwidth is 12KHz. So lower frequency component is 900 – 12 = 888KHz. (Formula: Fmin= Fmax-2*fm = Fmax-Bandwidth, where fm= Message Signal Frequency). Thus, Amplitude Modulated wave is the Sum of carrier and its product with modulating wave. Explanation: Envelope detectors are asynchronous in nature. The advantage of asynchronous detectors over synchronous is that it is simple, cheap, and faster to setup. In Synchronous detector, additional system for generation and synchronization of carrier are required, which makes the demodulator circuit complex and expensive.